Website Builder includes a light-weight contact manager, which you can use to create and collect email addresses. When used in combination with the included GoDaddy Email Marketing Starter plan, you can send out sales alerts, newsletters, and other items to promote your site. 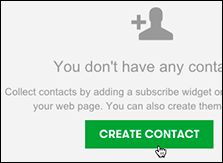 If you've not yet created any contacts, click Create Contact. 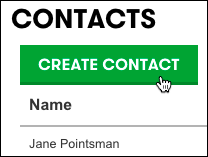 Complete the Create Contact fields, click Save, and the contact is listed in the Contacts panel. Note: Check the box below Save if the contact has agreed to receiving emails. If you don't check it, that contact will display in your contacts list. To create more contacts, click Create Contact in the Contacts panel. Complete the onscreen fields and click Save to add the contact to your Contacts list. Note: To add extra information fields, see Step 4 in Manage Contacts. See Manage Contacts to edit, delete, or work with your contacts. Can't remember which of your email addresses would be receiving replies from contacts? Setting up your website shows you were to find it in the Get Established page. Feature to allow repeat customers to setup an account? How to set up Customer Accounts for returning business ?